We’d love your help. 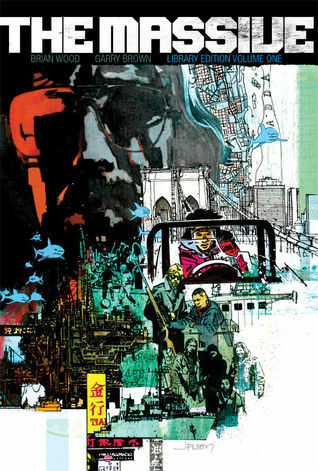 Let us know what’s wrong with this preview of The Massive, Volume 1 by Brian Wood. In a post-war, post-crash, post-disaster, post-everything world, the environmental-action trawler Kapital scours the earth’s oceans for its mysteriously missing sister ship, The Massive. This first ever library edition collects The Massive issues #0–#15 in a beautiful hardcover. To ask other readers questions about The Massive, Volume 1, please sign up. Although I really enjoyed reading this same material in trade paperback a couple of years ago, I enjoyed this hardcover library edition even more. Initially I was a bit skeptical about some of the plot devices and wasn't wild about the change in artists and art styles, but I'm beginning to think the book may be much stronger than I originally thought. I can't wait for the second library edition volume. Brian Wood was relatively new to me until DMZ came along, I have since hunted down other stories. The Massive is a very different book, it's one that sits on the fence of dystopia and the environment, a very odd mixture. I liked the book, it's an enigma wrapped in a treasure hunt storyline that has a topic that is super hot at the moment. I'm glad I have this series to finish. The storyline is a little hit and miss but the characters are the key here, they save this from becoming a melodramatic mess. Brian Wood creates real characters and they have depth, it's just a shame the core storylines don't engage or carry the same depth. There are a few issues that go nowhere, treading water until the next comes along. I enjoyed how the issue unfold, the art is very interesting and Wood keeps the characters at the centre. The treasure hunt storyline is central arc and along the way characters disappear and reappear, but it has the key arc that keeps this from going nowhere. I hope the reveal is worth the wait. I thought I might not like the book, but the central mystery is engaging and Wood never sacrifices characters for story beats. DMZ tends to have issues that lead nowhere but The Massive hasn't fallen into that troupe as yet, key word is yet here. The second volume is another heavy mass of issues so that will be more down time for me. I enjoyed the book, didn't love it, but the characters have grown on me so I'm eager to see how this concludes. Another high concept down right. The Massive Library Edition is a large size, luxury compilation of the first part of this Eisner-award winning dystopian series. There are a lot of ideas here - explorations of environmental disasters, humanity, and love/loss. Author Wood reaches deep and wide; and though it is a very uneven series, it definitely keeps a reader riveted. This compilation does end abruptly and without much resolution of the plot. But the broad, sweeping nature of this pan-global story means there is a lot to explore. Story: Captain Callum Israel, former paramilitary drone who developed a conscience and respect for the ocean, captains the 'Greenpeace' type ship, The Kapital. They do so in a world that is reeling from massive environmental disasters - hurricanes, earthquakes, typhoons, volcanic eruptions, etc. In this near-future, Hong Kong and New York City are underwater (the latter completely abandoned), oil and gas are currency, and world order has completely broken down. The Kapitol is searching for its sister ship, the Massive, which mysteriously disappeared and occasionally shows up on radar and then vanishes again. Callum navigates the world, trying to uphold nonviolence and conservation ideals in a world devolving into brutality and lawlessness. His crew is giving up hope, fracturing, and Callum's only ally is Mary - his mysterious lover. Most of the story follows Callum's journey in the search for the Massive - taking him around the globe and encountering various situations. From pirates to warlords, separationists to rebels. Callum faces betrayal from within and without as he acquires needed supplies. Wood plumbs many depths here and each political situation encountered by Callum is unique and quite involved. It makes for very distinct storytelling on many levels. Similarly, the characters are nuanced and carefully developed throughout the story. Some stay loyal, some rebel, some leave, and others change/grow as the Kapital encounters a world greatly changed within only a few short years of time. As the story progresses, the hopelessness of constantly missing the Massive as well as the mystery of Mary and just who (or what) she is take their toll on the crew and captain. At times, it can feel preachy and overwritten. Yet there is a lot of subtlety here - a discretion needed considering the obviousness of the overarching messages of environmental mishandling. Clearly, the ocean is the main character of the story and it is the ocean who is guiding/hindering/manipulating the Kapital and its crew. It could have been pretentious but clever writing saves this from becoming trite or dreary. The art design is effective and I appreciate the choices made among the characters and all their various nationalities. But it is also very inconsistent, starting out strong but losing momentum further in. But these first several issues did receive an Eisner Award for coloring. I’ve wanted to read this for a while so I found it most auspicious when I was offered the chance to review the TPB of Volume One (Library Edition). It possesses many of the things I like in a story: scifi, mystery, and a post-apocalyptic world. Written by Brian Wood with most of the art done by Kristian Donaldson and Garry Brown, it offers up a world not far off from our own. Callum Israel is a disillusioned mercenary who leaves his life of violence to found a group called the Ninth Wave. Refurbi I’ve wanted to read this for a while so I found it most auspicious when I was offered the chance to review the TPB of Volume One (Library Edition). It possesses many of the things I like in a story: scifi, mystery, and a post-apocalyptic world. Written by Brian Wood with most of the art done by Kristian Donaldson and Garry Brown, it offers up a world not far off from our own. Callum Israel is a disillusioned mercenary who leaves his life of violence to found a group called the Ninth Wave. Refurbishing an old ship which they name the Kapital, the group works with a larger ship called, The Massive. They are direct action conservationists who, like Greenpeace, record environmental events and use non-violent means to stop abuses. However, a series of catastrophic events, man-made and natural, cause societies and cultures to implode. In North America, both the east and west coasts are submerged. Tsunamis devastate continents, global economies crash, magnetic storms bring down satellites and what’s worse for Callum and his crew—The Massive disappears during a storm. Now the mission is to find their sister ship and try to stay alive. Faced with pirates, storms, and despots who have taken over deep sea drilling stations, Callum depends on Mag, an old mercenary buddy; Lars, a good guy in over his head and a woman named Mary, to help run the ship. They are a ragtag team, but it works. Callum almost always has to reel in Mag from his former violent ways while Mary is the real mystery. She is not only able save herself in the direst of situations, but others as well. As in any good story, Callum possesses secrets of his own as well as other members of the crew. The comic is structured in a series of flashbacks that not only develop character, but move along the story. Pacing is done extremely well as we are given just enough pieces of the puzzle to be satisfied and yet intrigued at the same time. Each chapter leaves you wanting to know more which is great. Initially, I did find it off-putting that we were not given any background information on Mary like we were for all the other male characters, but as I read on it became apparent why. Mary is the enigma. She is strong, resourceful and pretty much super-human at times. I imagine who and what she is will be revealed in a later issue. My only bump was that 2/3 of the way into the book, Callum and Mag suddenly didn’t trust Mary after all the amazing things she had done for them. Her loyalty should never have been in question and I found it odd that it came up here, then never happened again. I loved the art of Donaldson and Brown. They seemed to have really nailed the characters and their nuances. However, the art for the Polaris sections of “Breaker” and “Nunatak” didn’t quite equal the previous chapters. In “Breaker,” it seemed like the artist felt compelled to give Mary and Lars a softer more feminine look which neither had before. “Nuntak” I simply did not care for, but taste in art is subjective. The theme of how the ocean speaks to us in different ways recurs throughout the story. I suspect that since life evolved from the sea, the writer is using that primordial call to teach us lessons we might not otherwise want to learn. Previously published at Fanbase Comics. Decent ec0-techno-thriller-whateverer. This volume ends just when things start to get interesting. If Vol 2 doesn't start edging away from what it is doing now, I will give up on the series.